By default, Moodle courses are created 30 days prior to the first day of class and students are enrolled into the course 14 days prior to the first day of class. You can change the dates of these processes, up to a limit of 60-days prior to the first day of class, if you are listed as the instructor of record on the mainframe by your department. 1. Log on to Moodle. 2. Click the Creation & Enrollment link in the Course Preferences System block on the Home level of Moodle. 3. 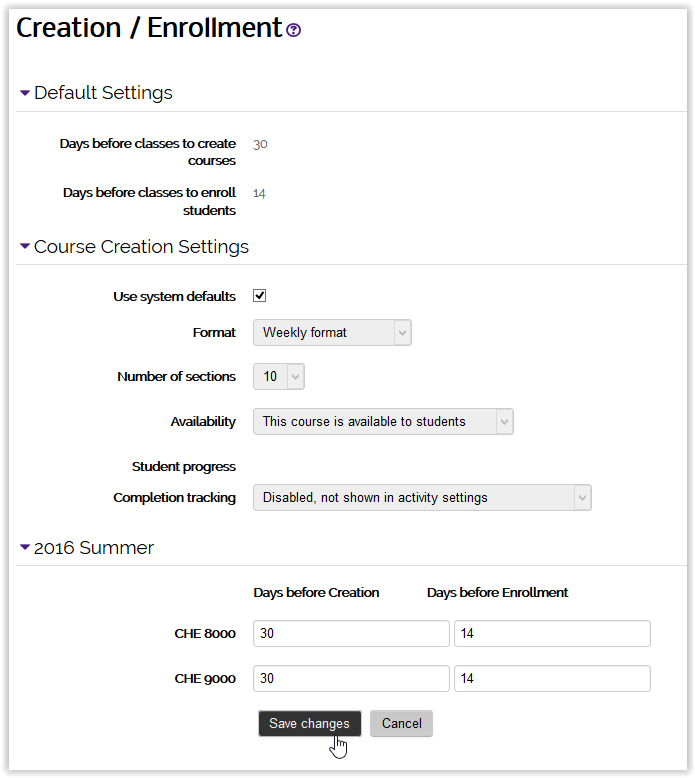 In the text boxes for creation and enrollment, enter numbers for how many days prior to the first day of class you want these processes to take place. For example, if you would like your course(s) to be created 50 days prior to the first day of classes, enter the number 50 in the field under 'Days before Creation.' The upper limit is 60. The creation value must be larger than the enrollment value. 4. Choose Save changes near the bottom of the page. Note: If the Date is within the window of days prior to the first day of class, your course will be created immediately, but student enrollment from the Mainframe is still an overnight process. 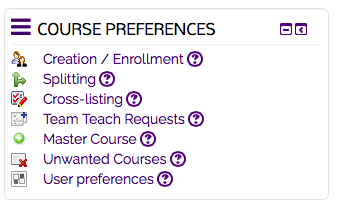 Course Options can also be updated in this Course Preferences System. These options apply to all of the new Moodle Courses created in the future. There are options on how your course is set up. You can choose between (1) Weekly Format or (2) Topics Format for your Moodle Course. The default format is Topics Format. This indicates the Number of Sections that you want in your course (Either # of Weeks or # of Topics). This can be changed to a different numeric value as needed. This identifies whether or not the Students enrolled in your course can View the Course. This must be changed to "Available to Students" before the enrolled students will be able to see this course in Moodle at the beginning of each semester. The default setting is "Not Available to Students". Completion Tracking is a way that you can track which students have completed which Moodle Activities. The default setting is "Enabled" & it can be disabled as needed. 4. Click the Save Changes button after all necessary updates are made.